Here we go again with another rental regret that I have weighing on my conscience from my horror movie renting days in the 80’s. Now to clarify, this is a movie that I always saw at my local video store and for whatever reason passed over and rented something else. And now I’m having regrets! Hence the name of the post. And the movie I am speaking of is…………..
Thirty years have passed since the grisly murder/suicide of Colin Childress, creator of the comic book, Cellar Dweller. But, as often happens to those ignorant of it, comic book artist Whitney Taylor is doomed to repeat history in a most grotesque way. Little does she know that her twisted renderings will soon reincarnate the bloody hysteria of Cellar Dweller. Jeffrey Combs? Lily Munster? That guy from the 80’s show Head Of The Class that went on to be a bad director? Pentagrams written on the cover of books? Oh, how the hell did I pass this up (shakes fist vehemently in the air). Not to mention that it’s directed by John Carl Buechler (Friday The 13th Part VII, Troll) to add some more interest. Alright, I can be the bigger man and admit when I’m wrong. And I’m going to right that wrong and seek out Cellar Dweller as soon as possible to enjoy the full viewing experience! Much like that overstuffed burrito I just ate, I’m full of regrets. Most would say I’m also full of something else, but regrets are what we’re talking about right now. And I always had regrets back in my VHS-renting days of horror movies that I couldn’t quite pull the trigger on. Enter into the mix the 1987 blockbuster Scared Stiff! I figured if I threw the word ‘blockbuster’ in there that you would be more inclined to keep reading. Ahhhh – look at that beauty. How did I never rent this? Oh I’m sure I just passed it by and rented Slumber Party Massacre II for the tenth time. I’m always a sucker for good title font, and I actually kind of dig it here. Reading the synopsis more closely, it looks as though the plot revolved around voodoo curses and slave owners. Not exactly my cup of tea when I was a 13-year-old horror movie upstart, but I’m sure I could have taken a chance on it. Looks as though Variety magazine was quoted as saying that Scared Stiff was “……..too explicit for the squeamish.” What the hell, man?! I love explicit things! Only one way to settle this once and for all and see if I should finally watch it. To the Youtube trailer! Oh man. I’m sold! And it looks as though the only thing that’s really explicit is the bad acting. And those terrible effects too. This has ‘pack and bowl and watch’ written all over it. I’m going to go out on a limb here and say that Scared Stiff has probably not gotten the Blu-ray treatment thus far. That’s ok, I’m sure I can find a watchable version on eBay. Let me look……(do do do….do do do….do do do). Ok, I’m back. Didn’t find a VHS or DVD, but I did find THIS. For those who don’t want to click the link, it’s a promotional paper weight for the film. So……if you’ve ever wanted a Scared Stiff paper weight, there you go. 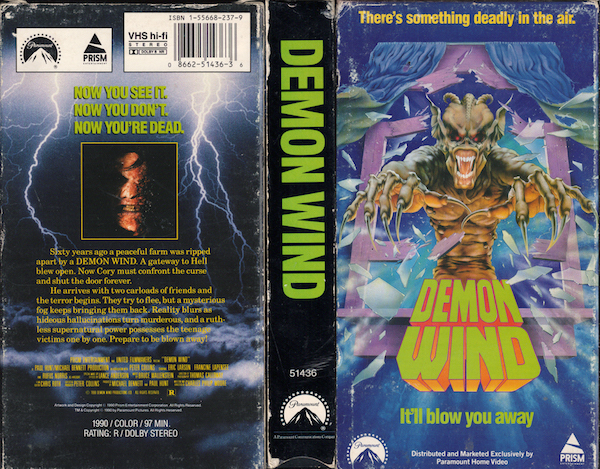 Now for those who don’t know, Demon Wind had one of those fancy lenticular VHS covers that moved when you tilted it back and forth. I remember picking it up and being hypnotized by the cover, but for some reason I just didn’t deem the movie worthy of my time. Perhaps it was because of the taglines ‘There’s something deadly in the air‘ and ‘It’ll blow you away‘. My younger mind may have thought that Demon Wind was about a deadly fart that you couldn’t escape once it got into the air. When in fact it’s just about a bunch of stupid kids who go up to a farm to investigate some missing grandparents or something. Luckily though, someone on Youtube was kind enough to compile a ‘best of‘ clip highlighting some of the classic moments to help sway me into possibly watching the full movie. Spoiler alerts obviously. Ok. What the hell was I thinking not renting this movie back in the day? First of all, the magician scene was probably one of the best and most ridiculous scenes I’ve ever witnessed in a horror movie. And that alone makes Demon Wind a must-watch in my book. Add to that the terrible special effects and make-up, and we have ourselves a winner here as far as ‘best horror movie to watch when you’re fucked up‘. It looks like the original VHS version with the lenticular cover goes for upwards of $35 and there seems to only be a Region 2 DVD release. All signs point to Scream Factory or someone like that giving this the high-quality transfer that it deserves. I was wrong about you Demon Wind. You’re more than just a deadly fart movie. So much more.